Class group photo. Top (left to right): Carlos, Gabrijela, Michael, Charlotte, Maha, Alyson, Shaya, Huy, Javier. Bottom: Finn, Jeana, Pranati, Phil, Naiky, Reem, Seung, Katelin, Russell. Congratulations to Design Build: Street Seats 2017 for receiving a Notable Mention in the Core77 Design Awards: Design Education Initiatives. 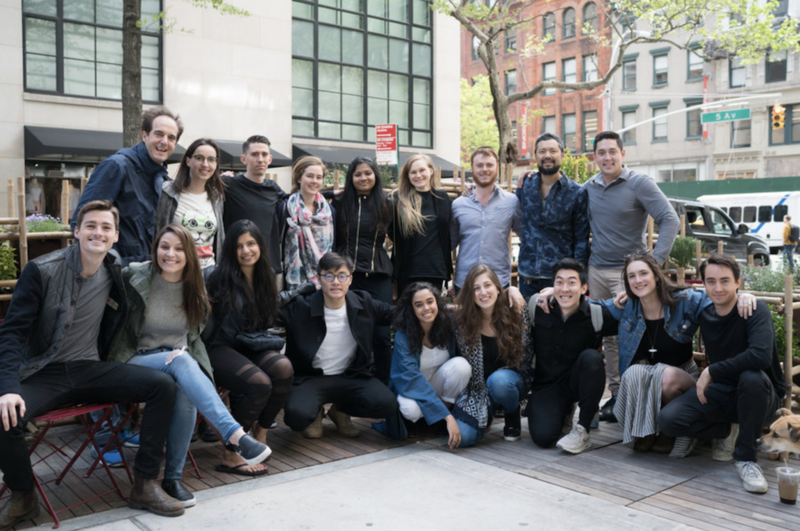 The 2017 iteration of Street Seats, taught by Parsons Adjunct Faculty Huy Bui and Carlos Gomez de Llarena, engaged students across disciplines, from Architectural Design, Interior Design, Product Design, Integrated Design, Design and Technology, and Lighting Design. The class explored the meaning of materiality and impermanence, with the intention to incorporate natural, time- and weather-dependent elements of vegetation and solar illumination into a cohesive urban landscape. Please visit Core77 Design Awards’ honoree page for more information and vote to help them win the Community Choice Award!